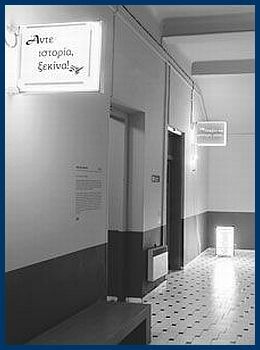 Posted by grhomeboy in Arts Events Greece, Arts Exhibitions Greece, Stage & Theater. The second part of “Common View” a project that aims to bring the visual arts into dialogue with theater, opened yesterday at the New Stage of the National Theater. Curated by Ghislaine Dantan and Eleni Koukou and initiated by Yiannis Houvardas, director of the National Theater, the project invites visual artists to make works that address issues related to performance. The works have been placed in the foyer of the theater, the first part took place in the vestibule of the Rex Theater, part of the project’s challenge is to make contemporary art relevant to both a visual arts public and adherents of theater. The newly inaugurated second part includes an installation by Dimitra Vamiali and a performance by Giorgos Sapountzis. Vamiali, who will also participate in the upcoming third and final part of Common View at the end of the month, has taken excerpts from the scripts of the plays performed this season by the National Theater and presented them in the form of panels that resemble old-fashioned commercial signage. Giorgos Sapountzis, who has made several public performances aimed at sensitizing us to urban sites, will be showing a three-hour, audience-interactive performance scheduled for Friday night at the Pedion tou Areos. His performance makes reference to Shakespeare’s “The Tempest” which opens at the Kappa Theater on the same day. For participation, the general public should contact > commonview@n-t.gr. Dimitra Vamiali’s installation is being shown at the National Theater’s New Stage, 41 Evmolpidon Street, Gazi, Athens. The installation is open during the theater’s hours of operation. Videos documenting four different performances by Giorgos Sapountzis are also presented alongside.